In this video and post we are going to analyze a property that was recently advertised on BiggerPockets as a potential BRRRR real estate investment strategy candidate. An Overview: What is BRRRR? How Does CapEx Affect Your Investment Over Time? Does it meet the 70% rule? What Can We Do To Make This Deal Work? Summary: Is This a Good Deal ? In short, BRRRR is an investment strategy that allows you to repeatedly reinvest your initial capital to build your rental property portfolios. It stands for Buy, Rehab, Rent, Refinance, and Repeat if you were successful in the previous four steps. So let’s take a look at the candidate property and see if we have a deal on our hands. 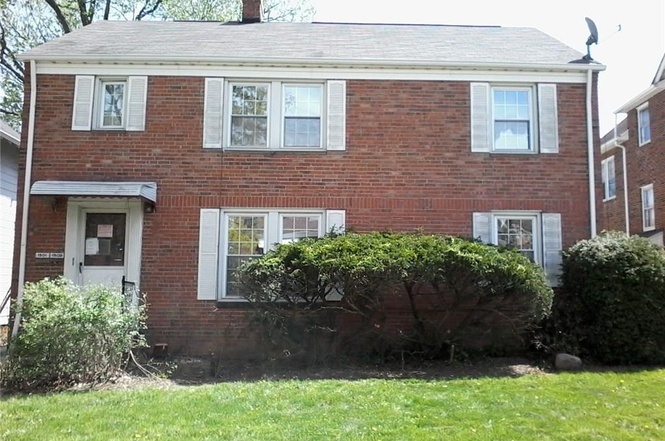 This property is a duplex listed for $64,900 with $1,500 dollars a month in advertised gross rents. That certainly has a lot of potential as it meets the 2% rule, which is a general rule of thumb to help you initially filter investments. The rule of thumb is that the gross monthly income for older properties or ones in higher risk neighborhoods should exceed 2% of the purchase price. In this case, $1,500 in revenue divided by the $64,900 purchase price is about 2.3%, which meets the threshold for us to continue analyzing this opportunity. In order to perform due diligence on the deal, first we have to gather all of the relevant facts that are needed as a basis for the analysis. Of course the first thing that we want to do is to perform a Comparative Market Analysis (CMA) of comparables (comps) to determine the After Repair Value or ARV of the property. This is the value of the property as if we were trying to sell it in an improved state, as if we were trying to flip it after doing a rehab. The agent is advertising an ARV of $90-$100K so let’s validate that those are accurate numbers. 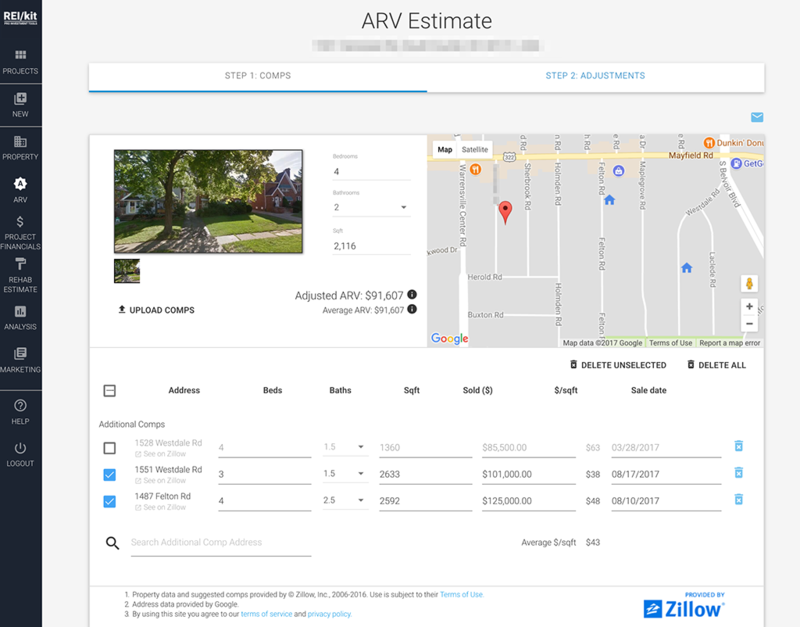 Just like we did there, we’re going to use an export of MLS comps from Redfin which can be uploaded into the REIkit ARV Calculator. 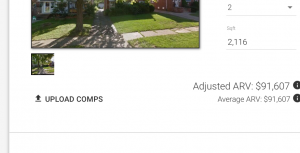 If you are using the FREE version of the ARV Calculator then you have the ability to add each Redfin comp manually as shown in the video. Premium plans also allow you to automatically upload a CSV export from Redfin or any MLS as shown here. 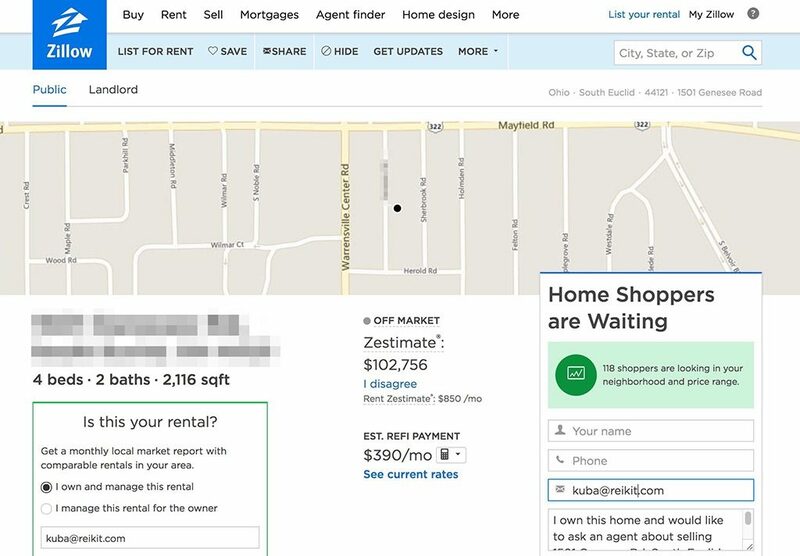 In some areas and for some properties the Zillow API, which REIkit uses to get property basics, is restricted in the data that it can share, so in this case we have to add the basics of beds, baths, and square footage manually for this property. This is a good crosscheck to do anyway between your data sources for any property that you find on various sites. For example, the BiggerPockets ad is claiming that there are 2 units of 1,135 square feet, which totals 2,270 square feet. 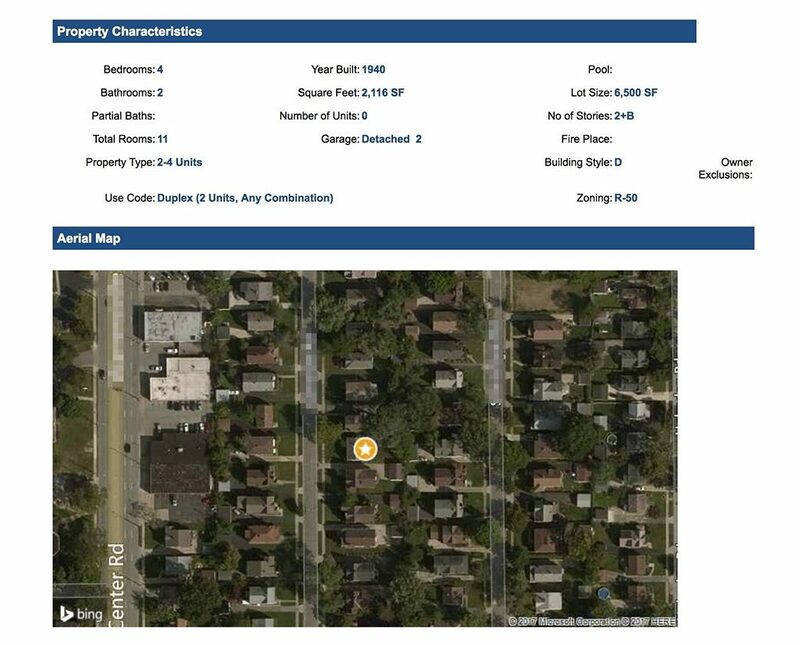 On the other hand Zillow shows 2,116 square feet in its basic info area. This is also corroborated when you look at the public record. Additionally, Redfin showed that there are over 3,000 square feet when including the basement. The lesson is to always dig a little bit deeper when you’re doing your due diligence. In this case we’ll use the public record above grade square footage at 2,116. This is in line with what was advertised. Next, let’s enter our potential rehab costs based on the pictures in the ad. For the kitchens let’s do new cabinets, new counters, and new appliances for a total of $8K per kitchen or $16K for both. 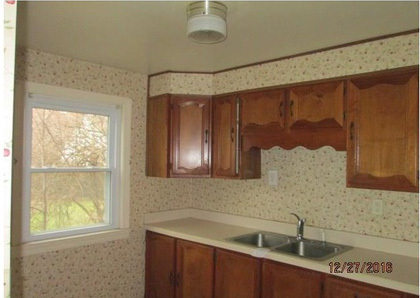 In the bathrooms, we can glaze the pink tile, but otherwise they look pretty decent, so maybe a new vanity, and new toilet in each. 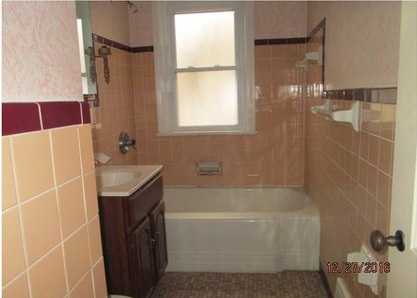 Let’s say $2k for each bathroom for a total of $4K for both units. For painting and finishing, if we paint the entire 3,000 square feet including basement at $2 a square foot, then we can do the entire place for $6,000. For flooring, we will either put in carpet or laminate at about $3 a square foot, and only over an area of 2,000 square feet, for another $6,000 in costs. The water heaters look like they’re pretty new, let’s say 5 years old, so we won’t replace them just yet. 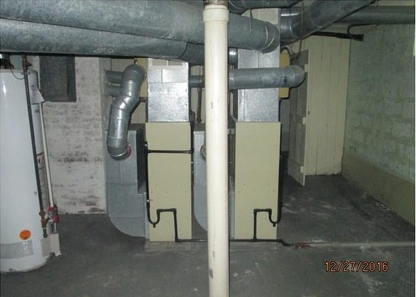 The furnaces look like they’re about 10 years old, so we’re also going to wait to replace those. The roof looks pretty new too, and the windows look new as well. So our total rough rehab estimate is about $32,000, which is a little bit higher than the advertised $15,000 to $25,000 but not by too much. Later on if it’s still a potentially good deal we can tighten up those numbers by building a detailed rehab construction cost estimate using the construction cost items available to premium members. But for now, we’re trying to make sure that this is a worthwhile opportunity. 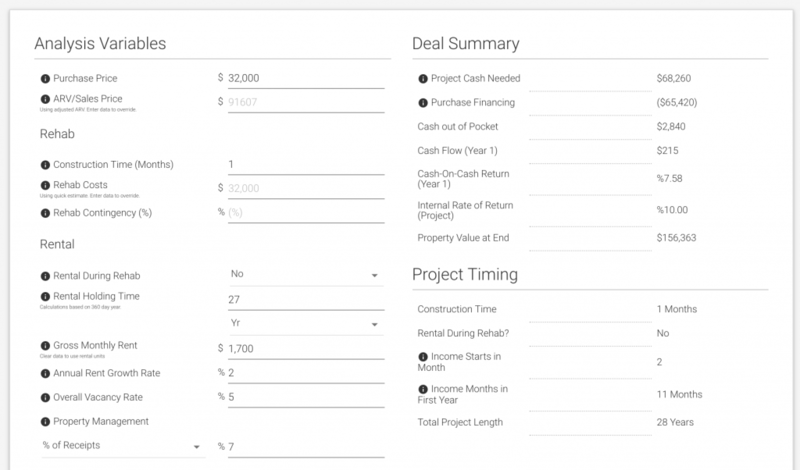 So next, let’s run through our project financials by putting in our purchase, sale, and holding costs, as well as our financing so that we can model the loans for the Buy, Rehab and Refinance parts of our strategy. First off we’ll enter the basics. For the purchase price let’s start off with the current listing price. The sales price, on the other hand, reflects our adjusted ARV, or the price that we think we can sell it for after our improvements. If you remember, we determined the ARV to be about $91,000 by using our comps analysis. For illustrative purposes, let’s say that that rehab will take us about 1 month to complete. So for purchase costs we generally add $300 for title insurance, $500 for appraisal, $300 for inspection, and 1% of purchase price for closing costs. For sale costs, a 5% commission, 1% of sale price for closings costs, and $300 for great photographs. In some areas where the transfer taxes are particularly high, we also call those out as a line item. Given that this is a rental property, we won’t be offering to pay any buyer’s closing costs or even staging the property, as presumably, it will be occupied when we eventually sell it. For operational expenses we’ll start with our annual taxes, which are $2,717 for this property. We like to keep the expense growth rate at about the same as the rate of inflation, which is about 2% right now. 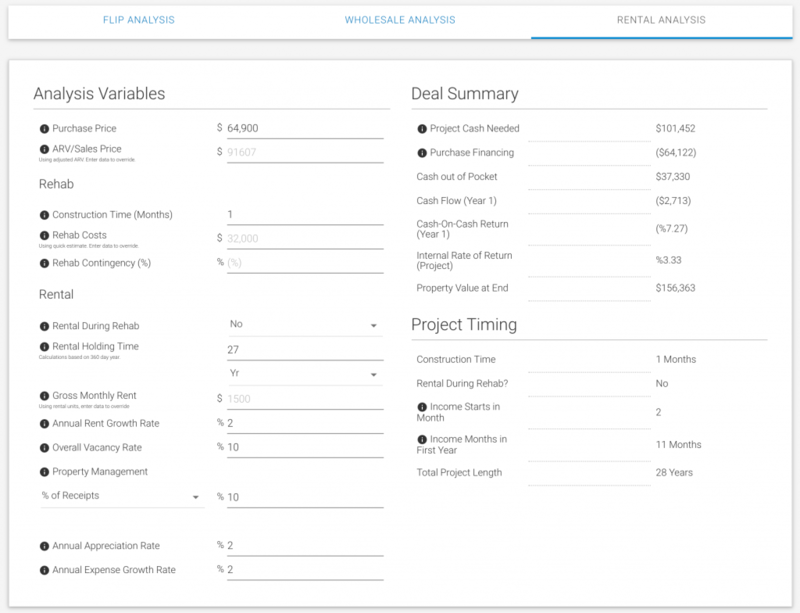 For property management, let’s start with 10% of rented revenue. And for the rest of our utilities, the tenants will be responsible for their own metered water, cable and electric. We will have some electric responsibility ourselves, let’s say $30, and of course $100 for insurance, $30 for trash, and $100 for lawn care. 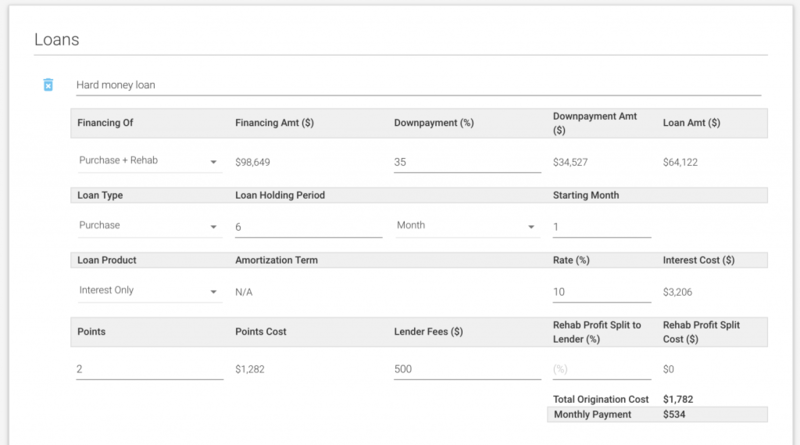 So let’s model the Buy + Rehab and Refinance loans. For the Buy and one month’s worth of Rehab of the property, we’ll get a hard money loan that covers both the purchase and rehab costs. 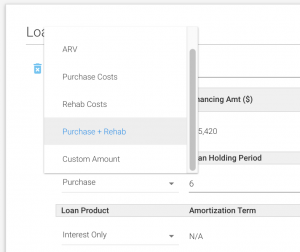 This is one of a few dynamically calculated choices available to us to preselect from the dropdown in the financing section, which also includes ARV, and even any custom amount. Now since our hard money lender will only lend to us up to 70% of ARV, we’ll need to figure out how much we will need to put down in order to cover the amount needed for our purchase and rehab costs. In order to figure this out, first we’ll need two numbers: we need to know the total of purchase and rehab costs; and then we need to know what 70% of ARV calculates to. Having selected purchase and rehab costs from the dropdown, we get $98,649, which includes our purchase price, purchase costs such as appraisal and inspection, and rehab costs and contingency (if any). To find out what 70% of ARV totals, if we instead select ARV in the financing selection and add a 30% down payment the result will be our maximum loan amount. In this case that’s $64,125. what we get is that our 70% ARV loan will cover 65% of our initial costs, and we will thus need to put down the other 35% in our own cash to cover the remaining purchase and rehab costs. This is a purchase loan that will be held for 6 months while we are waiting to refinance after the 6 month FHA seasoning period. The loan is interest only at a rate of 10%, with 2 points, and $500 in lender fees. Now let’s add the conventional refinance loan. After 6 months we’re going to refinance at 70% of ARV, meaning the equity remaining in the house will be 30%, so we’ll enter 30% in the down payment section. We will hold this loan for 27 years, which is the depreciation period, with the loan will start at month 7, right after the seasoning period ends. The loan will be a standard 30-year amortized mortgage at a rate of 4% and no points or fees. 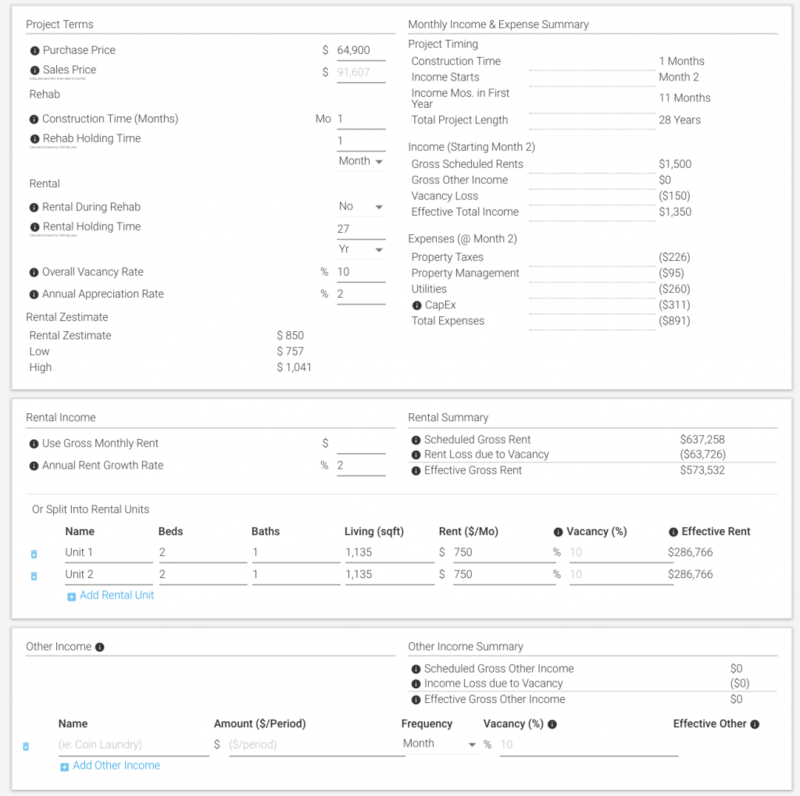 Now let’s add rental specific property parameters. We will not be renting the place while it’s being rehabbed for a month, so it will be vacant at that time. Speaking of vacancies, let’s start off with a 10% overall vacancy rate, and at least in this neighborhood a historically low appreciation rate at 2%, giving us a hint that we should not expect appreciation as part of the return equation. The income of this property is currently advertised as a possible $750 per unit so let’s start with those numbers. There is no other income potential listed, but if you had assigned parking or laundry for example, you could add those as well. So the only thing left to enter on this page is CapEx. Many folks start off with keeping an arbitrary 5-10% of their income for reserves, and we’ll show you how inadequate and destructive to your business choosing an arbitrary amount can be. 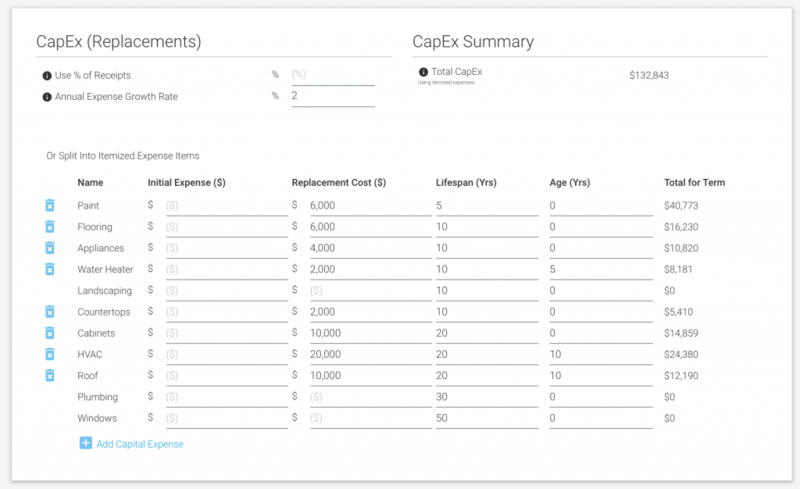 In order to show you that, first we’ll enter the itemized CapEx costs. So for this property, the paint, flooring, appliances, counters and cabinets are new because we just rehabbed them and we’ll use the same numbers as we did for rehab costs. 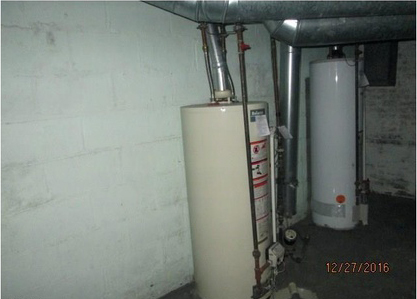 From the pictures it looks like the water heater, HVAC and roof are about 5-10 years old, so we’ll enter those into the age sections. Remember that since this is a duplex, with the exception of shared systems like the roof, we will have to double everything. So if we were to do what people often do, and that is hold back an arbitrary percentage of receipts for reserves, in this case let’s do 10%, we will have only put away $57,353 to keep the property maintained. On the other hand, if we itemize our CapEx costs, based on the lifespan and replacement cost of our major systems, we should expect that we will actually spend over $132,000 for replacements. That’s more than twice as much than initially planned to maintain this property throughout our holding period. How Do Capital Expenditures Affect Your Investment Over Time? Let’s go to the analysis section, and see what it looks like when those costs hit, and talk about our state of mind throughout the ownership period of the investment. In the first 5 years, we’re doing great. Nothing is breaking down, and eventually at year 6 we get our first small hit to the bottom line with an expense for new paint, or new cabinets, just to freshen the place. Then we happily go on for another 4 years. No big systems need replacing; we’re feeling good about our cash flow; and patting ourselves on the back for being such awesome investors. Since nothing is breaking down, we feel justified with our reserves holdback. At year 11 BAM! a huge hit when everything seems to go out and we need to come up with almost $60,000. It would take 8-10 years of using 100% of our cash flow, a decade of working for free to recover from that kind of a hit. Now we feel like we’re drowning, but maybe we survive it and use the cash flow from our other properties to help overcome our deficit. Only 5 years later we get another small hit to the bottom line. And 5 years after that another huge hit that would take 4-5 years to recover from. It’s no wonder why so many people fail at rental real estate. When a property is undercapitalized through the use of arbitrary holdback amounts instead of going the extra step of calculating expenses based on well-understood costs and lifespans of a home’s major systems, the most likely outcome is that the investment will sink, and possibly take a few others along with it. It’s human nature to get overconfident in our abilities when nothing goes wrong for a period of time. That usually happens right before we get hit with bill after bill that we haven’t planned for and can’t afford, and especially if we went into a deal where the lack of reserves holdback was what made the deal work in the first place. So if we go back to the CapEx section, if we expect that our itemized CapEx will cost over $132,000 over the holding period of the property, then our reserves should be closer to 23% of the receipts, if we’re only collecting $750 per unit in rent. Of course this will be different property by property, depending on the produced income and the expected quality of finishings. 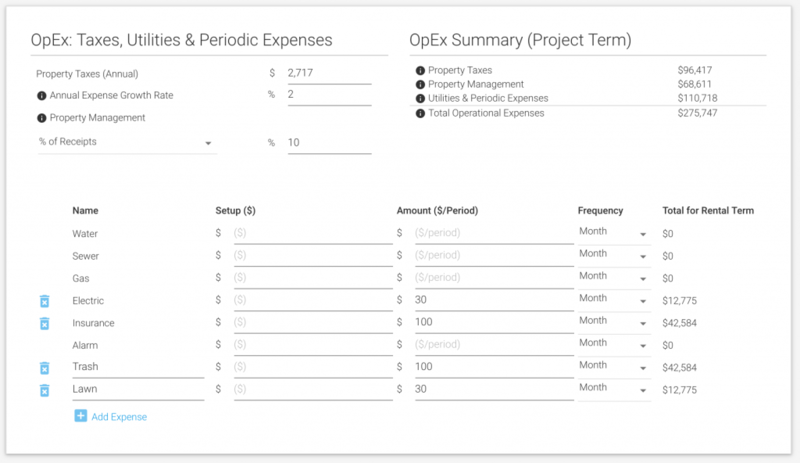 So now, when we go back to our analysis tab, we can see that when we adequately plan our reserve expenses, no one year hits us so hard that we have to liquidate, and we can maintain a predictable cash flow. So let’s do a thorough analysis of this property. In order to ensure that you have enough equity in the deal so that your refinance step allows you to extract most if not all of your original investment, you might want to start off with using the 70% flipping rule to determine what your purchase price should be. The 70% rule is further described in the House Flipping Analysis post. 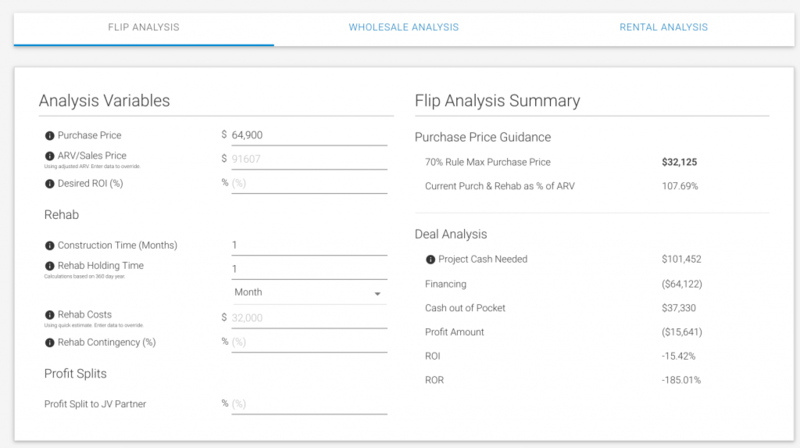 Using our flipping analysis tab, you can see that when including the rehab costs required to improve the property, you would need to purchase it, at around $32K, $32,125 to be exact. So not looking good so far for equity at the current listing price. 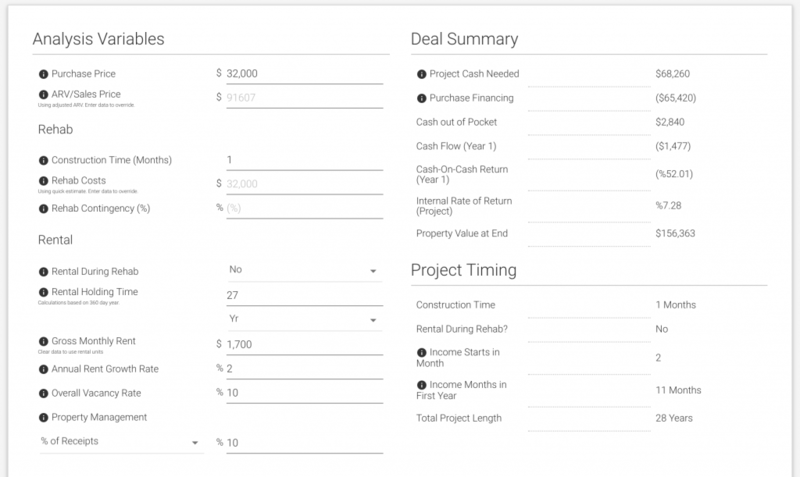 Many people aim for at least $100 per door per month for cash flow, and depending on their cost of capital, at least an 8% internal rate of return. Looking at our rental analysis, we see that we’re starting off with negative cash flow, and therefore a negative cash on cash return, so not too good there. Additionally, the project wide internal rate of return is just above 3.3%, which is a pretty terrible use of capital. So the question is: Are there any levers that can we pull, to make this deal worthwhile? Well obviously the first one is purchase price. Given that this property has been sitting for over 6 months, it is no doubt overpriced. So let’s change the purchase price to $32,000. Yes, it’s highly unlikely that an owner would take less than half of asking price for an on-market property, but if you wait until the listing gets canceled before you approach the seller, then the seller is much more likely to entertain your lower offer. Reducing the purchase price, improves the IRR to above 5.4%. With that change, the purchase and rehab costs are now near 70% of ARV, and so we should also be able to change the financing to be 100% of the project. This should eventually improve our cash on cash return, if we can get our cash flow into the positive. Unfortunately, changing our loan amount also has the negative effect of slightly reducing our rate of return, given that we’re paying slightly more to the bank. The next thing we can try is raising rents. Currently both units rent at $750 each, bringing in only $1500 a month in total. 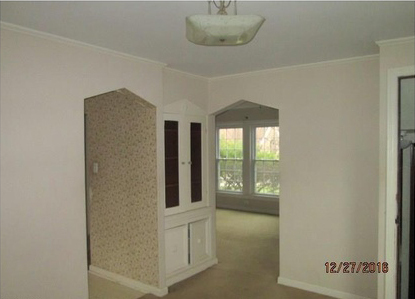 The Zillow rental estimate for a unit in this property is about $850, so let’s try using that instead. $850 X 2 = $1,700. Now our Internal Rate of Return rises above 7%. Since we’re using a percentage of income for reserves, when we change our income, we should also reduce our reserves holdback. Reducing our reserves to 20% of income has the effect of increasing our rate of return to above 8%. The next thing we can try is to reduce our property management fees and tighten up our vacancy rates. and maybe vacancies are closer to 5% in that area, and so again our IRR increases to 10%. With this change our income for the year also starts to exceed our expenses, and so finally, we end up with a positive cash on cash return for that first year. 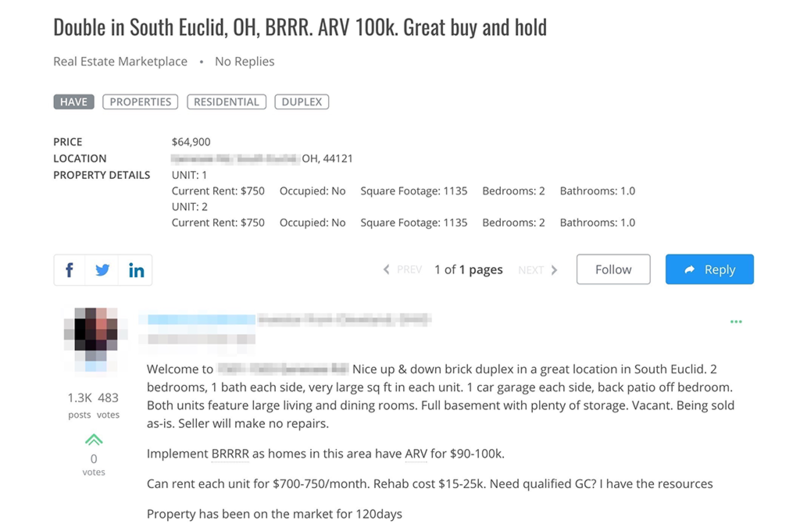 Summary: So is this a good deal using the BRRRR real estate investment strategy? Well certainly not as advertised. 1) We would have to purchase it at great discount, at less than half of the asking price. 2) We would have to ensure that we could raise rents at least by $100 per month per unit. 3) And because the income for this property is so low, we would also have to keep our expenses extremely low to get any positive cash flow out of the property, while still making sure that we have enough in reserves. So when you find a deal that looks great on paper, even one that exceeds the 2% rule, which is pretty rare these days, it’s worth doing a little more research to understand whether the deal economics actually work.